A dreamy summer holiday at the heritage hotel Baur au Lac. It was our last stop on a “lake trip” at the start of this summer, which took us from Lake Constance to Lake Como right through the Mediterranean coastline and to Lake Zurich — each waterfront emanating its own kind of sparkle and scenography. In the charming “Downtown Switzerland”, a relaxed holiday crowd took in the sun-swept glimmer of the lake from the Zurich Opera House, or by the promenade before an evening at the world-famous Circus Knie. At night, teenagers illuminated the dark waters with their iPhone “beatboxes”, Drake on high. Our splendid view of the lake that opens up to a glorious panorama of the Alps was from the rooftop terrace of Baur Au Lac, the historic hotel that since 1844 has welcomed Napoleon III to African kings, Alfred Hitchcock to Alfred Nobel, Audrey Hepburn and Donald Duck (who dined in comic with his tycoon uncle Dagobert Duck at the grand hotel), Joan Miro to Henry Moore. Legend has it Marc Chagall ruined the carpets of the property where he practiced painting the famous stained glass windows for the Fraumünster Church back in the 1960s. The vantage point is not only in its breathtaking view. Situated in its own private park, and framed by the romantic Schanzengraben canal on one side and the high-luxury shopping street Bahnhofstrasse on the other, makes this establishment the premier address, enhanced by its exquisite Art Deco-meets-Regency ambience, beautiful alfresco dining, and dazzling fresh floral bouquets. Our sumptuous suite designed by Frederic d’Haufayt spanned across two doors, making a whole stretch of luxuriousness from large marble bathroom to dressing area to lavish bedroom with views of the bright blue Swiss sky, into an art-filled living room, where homemade 1844 Chocolat Baur Au Lac and other sweet delicacies awaited every evening. Founded by Johannes Baur as a large villa by the lake, the heritage hotel is still family-owned and managed by his sixth generation descendant Andrea Kracht, who has kept Baur Au Lac’s magic of a grand luxury hotel with that home-away feeling. 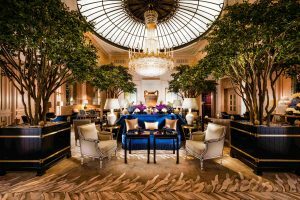 Kracht is also the chairman of The Leading Hotels of the World, and his charismatic Filipino wife Gigi, an art lover, personally curates the contemporary artworks throughout the hotel and its 119 rooms. “Art must vie with nature, which displays, even lavishes, all of its charms here,” wrote the Leipzig Illustrated Newspaper in 1855 on Baur Au Lac, headlined “Zurich is made more beautiful.” And certainly it has remained as such all 174 years. 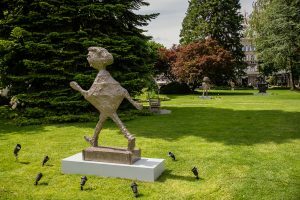 Every summer since 2002, the hotel oragnises ‘Art in the Park’, where sculptures by big name artists such as Robert Indiana, Fernando Botero, Louis Bourgeois and George Condo adorn the property grounds to elevate the guest experience, and also as the prelude to Art Basel. Alas, we stayed the weekend of the set-up, but still toured the park with Laurent Eperon, chef de cuisine of the hotel’s Michelin-star Restaurant Pavillon, walking through the gingko and cedar trees, and inhaling the natural fragrances from his prized herb garden. We stopped by a miniature Baur Au Lac, an in-house beehive that produces their own creamy Miel du Jardin specially bottled for guests. We enjoyed pots for breakfast, scooping the rich honey onto our crepes, stirring it into Earl Grey tea, and savouring spoonfuls for good measure. Dinner at Pavillon is another kind of experience, with Chef Eperon serving up Swiss classics-with-a-twist, and unique creations inspired by the season, his travels to Asia, and his childhood memories-matched with Swiss wines and his lovely sense of joie de vivre. Could our stay be more perfect? As they say, life is always better at the lake. London Design Festival 2018 must-explore interactives. The designer is one of four trustees chosen by the Prime Minister. #SkinSchool: What Causes Psoriasis And How Do You Treat It? Why it happens and what to do about it.